This must be one of the most iconic mountain bike rides in Marin. It's included on many lists of mountain bike rides in the Bay Area. It's an all-fire-road ride, though it still features enough technical challenges to satisfy the most advanced riders. Since the route takes you up one of the most prominent peaks in Marin County, you also get to enjoy pretty expansive views in all directions. I remember reading one description calling this "Marin's most remote ride". Since I can't think of a better candidate for that title, I'll have to agree. This ride is in the heart of mountain biking hallowed ground. It passes right through an intersection with Repack Road, which is where the Repack Race used to be held in the '70s. For those who don't already know, this race is part of what's considered to be the origin of mountain biking as we understand it today, and many of the pioneering local kids who started it for fun are among the top entrepreneurs and gurus of the mountain bike industry today. Much of this route also overlaps with the core of the route of the Appetite Seminar. This is a traditional, informal Thanksgiving Day morning ride that dates right back to those same formative years of mountain biking in Marin. It might just be the only regular mountain biking event still going on that dates back to those pioneering days in this region. For those who are interested in doing it, there's no organizer and no formal start time or meeting place for this ride. People just show up and ride. As far as I've seen, for most riders, wheels start turning before 9:00 AM. The ride starts from Fairfax and takes Fairfax-Bolinas Road to the beginning of the route you see on this page. After tracing most of this route, the most typical options are to take Repack Road back down to Fairfax or to turn earlier onto White Hill Fire Road in order to include at least a partial traversal of the Camp Tamarancho loop on your way back, as far as I understand. See here for some random snapshots from the Appetite Seminar in 2013, which is the only time I've participated in this ride. Another highlight of the ride is passing by a dwarf sargent cypress forest, where this rare tree has grown very little due to the soil character and trees of over 100 years old can be only a few feet tall. The ride starts out with the very rocky and (in places) steep climb up Pine Mountain Road. I actually enjoy this part quite a bit, because it's right on the cusp of achievability for me, and I therefore find it to be a fun challenge. After turning left and after passing near the peak of Pine Mountain, as the trail gets closer to Kent Lake, it starts a descent that becomes very curvy and surprisingly steep for a short section. Once you skirt a "tentacle" of the lake and climb back up to Big Carson Ridge, you find yourself on San Geronimo Ridge Road. This portion starts out as a climb that's similar to that first portion of the ride: rocky and fairly steep. After it flattens out and starts descending, the trail remains rocky in many places, which makes for a fun and (as far as fire roads go) highly technical descent. One thing that might be worth emphasizing is that parts of Pine Mountain Road and San Geronimo Ridge Road on this ride are some of the rockiest trails that I know in the Bay Area. 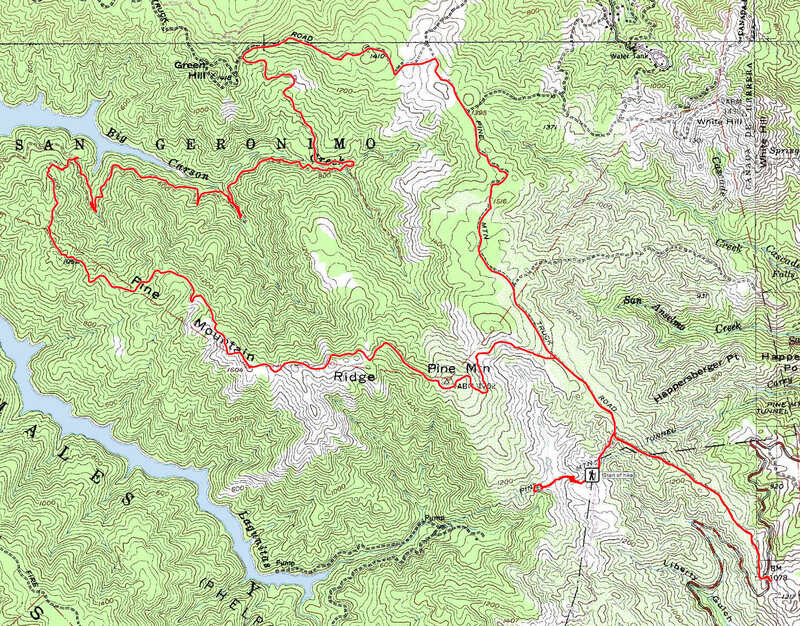 There are spots on this ride that would hold up well in comparison to anything you'd find at Annadel, Oat Hill Mine Road, or Eldridge Grade in terms of rocky, technical riding. This is a great opportunity for fun from the point of view of experienced riders. Meanwhile, novice riders needn't be discouraged completely, since most of these rocky sections aren't longer than an eighth of a mile or so, and can therefore be easily walked if need be. However, that still doesn't make this an "easy ride" by any definition. 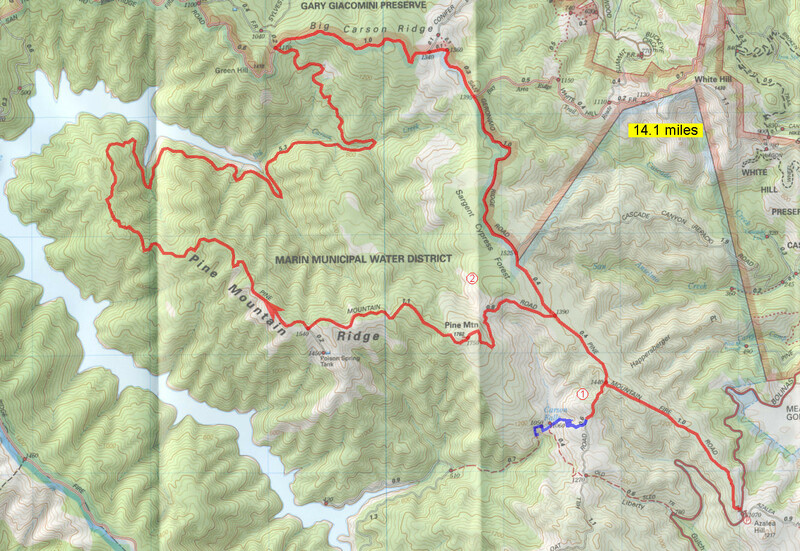 The route described on this page includes a hike to Carson Falls (off Oat Hill Road). It's shown in blue on the highlighted park map on the left. If you want to do that hike, you'll want to bring a chain and lock with you; you'll find poles near the start of the hike to which you can chain your bike. Note that the stats for the ride do not include this hike portion (but the elevation profile plot does). Including this side trip to Carson Falls will increase your total distance by about 1.5 miles (including the portion on foot) and your total climb by about 450 feet. If you're doing this within a few days of significant rains, it might be worth seeing Carson Falls while you're there. If it's the dry season, it might be better to leave it for another time. Fairfax could be considered the closest thing to a pilgrimage site for mountain biking and, as such, there are a number of places in tiny downtown Fairfax for coffee, some drinks, or a meal that are frequented by mountain bikers. Some quick suggestions would include the Java Hut or The Coffee Roastery for coffee, and Iron Springs pub or Gestalt Haus for a quick bite. I'm also fond of The Sleeping Lady for a post-ride meal; their salads and burgers are impressive, they have good beer and outdoor seating, plus the Ukulele Jam they have going every Saturday between 2:00 and 4:00 is a cute form of entertainment you might not find elsewhere (though the participating age group has a bit of a geriatric flavor). Finally, no biking-focused discussion about Fairfax could be considered complete without a mention of the Marin Museum of Bicycling. This local treasure has been (very justifiably) the new home of the Mountain Biking Hall of Fame ever since it opened in 2013. It's a great place to admire some seriously historic bicycles (some not even called that yet back then) going back to the 19th century and, more importantly, to see first-hand some of the very pivotal bicycles and read their stories from the early history of the sport, many of which were ridden on Repack Road and the other trails in the very hills surrounding the town. That's without getting into the distinct possibility of running into Joe Breeze himself at the museum, or one of the other "founding fathers" of mountain biking. I would strongly recommend this place to any first-time visitor. In fact, the museum is easily worth a visit in its own right to anyone who has a serious interest in the sport.